In critically ill patients, fluid status is a balancing act. Too little fluid resuscitation can lead to end organ hypoperfusion, while too much fluid resuscitation can lead to pulmonary edema and respiratory compromise. 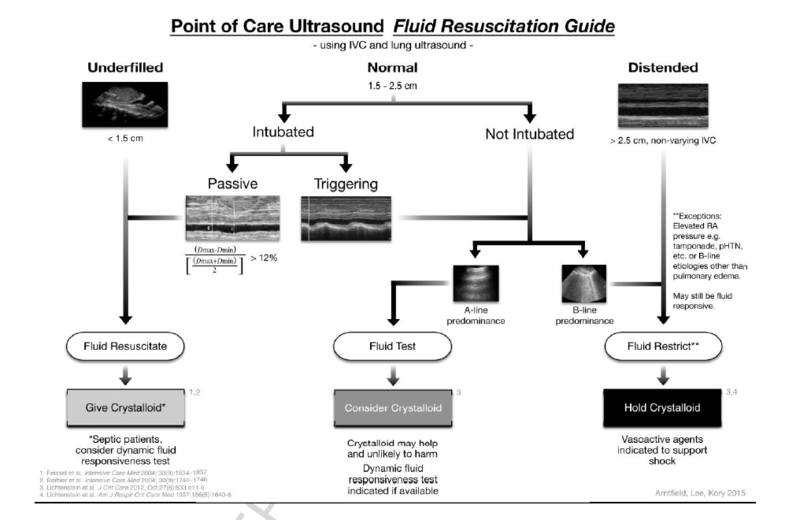 In some situations, it is difficult to differentiate who will benefit from more fluids and who will be fluid unresponsive or even require fluid restriction. Barbier et al: distensibility index: (Dmax-Dmin)/Dmin x 100%. Threshold of 18% has 90% sensitivity and specificity for volume responsiveness. FALLS protocol: A-line predominance indicates dry interlobular septa and low or normal left atrial pressure. B-line predominance associated with alveolar-interstitial syndrome: usually pulmonary edema, however may be malignancy, interstitial disease, or other processes. POCUS use is rapidly gaining momentum for a variety of clinical tasks, and clinicians are becoming more comfortable with its uses. We agree that this algorithm is feasible in the ED and can add valuable information to the evaluation of critical patients. Though prospective validation is still lacking, incorporating it into practice to help guide (though not determine) a course of action makes sense based on existing evidence. 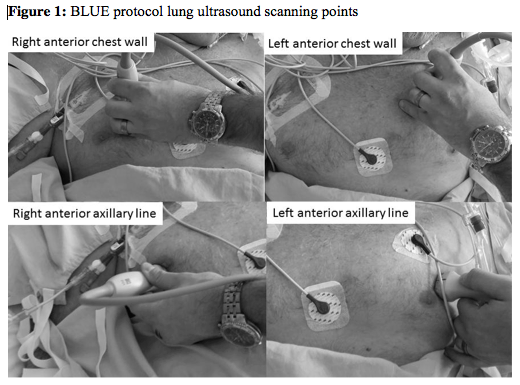 As emergency physicians continue to become more comfortable with POCUS, there is little doubt that this algorithm, or a revised version, will become a routine part of clinical evaluation of critical patients. Based on the existing literature, this algorithm creates a reasonable approach to assessing volume status and volume responsiveness in patients. As with any algorithm, it should be integrated into the entire clinical picture. In many cases, diagnostic ultrasound is found to be an accurate and reproducible tool compared to conventional tests.